The travel and tourism world put on a brave face for the 43rd ITB Berlin as those across the industry refused to let the global downturn dampen either their spirits or their willingness to exhibit at the world’s longest running and largest travel fair. (Above: South entrance, ITB Berlin 2009)This year’s show, which has been fully booked since February, featured over 11,098 exhibitors, compared to 11,147 last year. Visitor numbers also held up surprisingly well - overall attendance in the display halls was 178,971 compared to 177,891 in 2008. Trade figures rose marginally (up to 110,875 from 110,322 in 2008), as did consumer numbers (68,114 compared to 67,569 in 2008). “Unlike many other industries, the travel sector is actively responding to the challenges. Trade visitor attendance remained high, proof of ITB Berlin’s resilience even in economically difficult times. We are delighted that there was an increase in visitors from abroad,” said Dr. Christian Göke, Chief Operating Officer of Messe Berlin. The trade days also witnessed a healthy turn-out of tourism ministers - over 120 from around the world, proving the link between private and public tourism sectors is even more critical in times of hardship, and could prove the key to easing and energising the industry through the downturn. However the outlook from the World Travel & Tourism Council was less rosy. It unveiled its 2009 Economic Impact Research, which is widely-regarded as one of the most accurate barometers of things to come, during ITB. The research predicts that travel industry GDP will contract by 3.6% in 2009. And it is expected to remain weak in 2010 with only marginal growth, of less than 0.3%, currently predicted - on what will already be a weak 2009. ITB also released its latest trends report during the show. This predicts that internet bookings will be the big winner during the downturn, but that long-haul will fall sharply, and there will also be much pain in the business travel and MICE sectors. However he pointed out that travellers are increasingly using the internet, in particular using mobile phones, not just to find information, but to book and pay for holidays. The internet as a travel tool will continue to grow in 2009, according to the survey. Online portals such as City.mobi, the world leader in mobile travel portals, City.mobi, are set to reap the rewards. City.mobi also unveiled its new berlin.mobi site at the show. In the exhibition halls, the world’s newest nation, Kosovo, made its ITB debut. A number of hotels also made their first appearance, including the Bahia del Duque (Tenerife) and the Gran Hotel Valentin Imperial Maya (Cancœn). 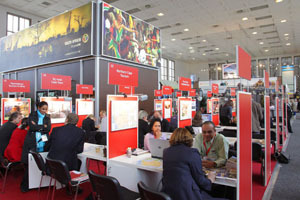 There was also lots of excitement at the Marriott stand with the Praia D’EL Rey in Portugual’s Oeste region announced as the host of the European leg of 2009 World Travel Awards. The ITB Convention proved particularly popular with many seminars and sessions geared towards finding position solutions to tackling the downturn. Highlights included Wallpaper and Monocle founder Tyler Brûlé talking about the world’s most liveable cities.